Roberts Motor Bodies is a family run business, established for over 40 years and boasts a respected reputation within our field, throughout the UK and in to Europe. As well accident repairs our services include custom bodywork, fleet contracts, paint re-finishing, classic restorations, motorbikes and we are a noted fibreglass repair specialist. On request we can collect and deliver your vehicle as well as provide a courtesy vehicle subject to availability. Bryan has more than 40 years experience in body repairs, including customising his own classic American cars and has been painting, re-building and driving them since 1975. 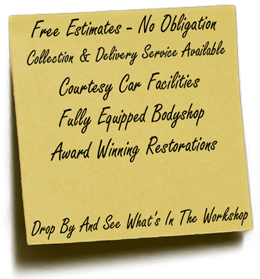 We welcome you to call in for a free estimate or to inspect current work, you will always find a collection of vehicles to fascinate any enthusiast.